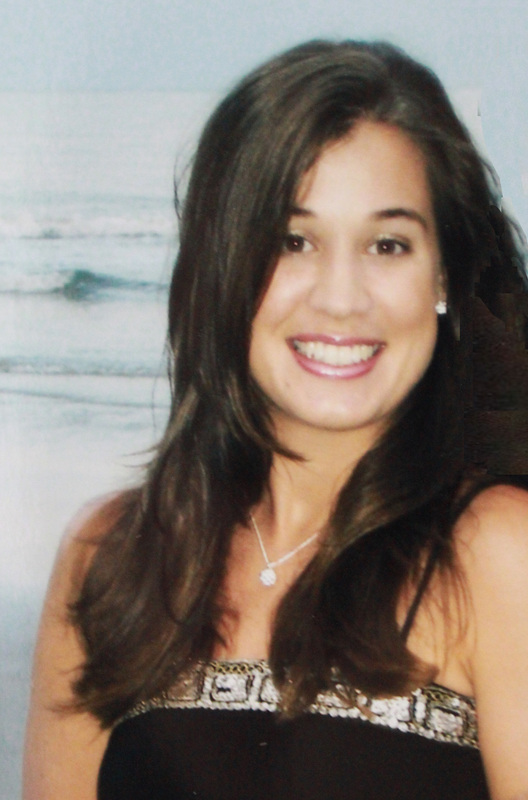 Yay, today I get to introduce you to my last regular contributor, Rachel. We have very similar opinions on getting kids involved in the organizing process and setting them up for success along the way. Rachel will be blogging here twice a month and I’m super excited that she’ll often share organizing tips to help us with our kiddos. 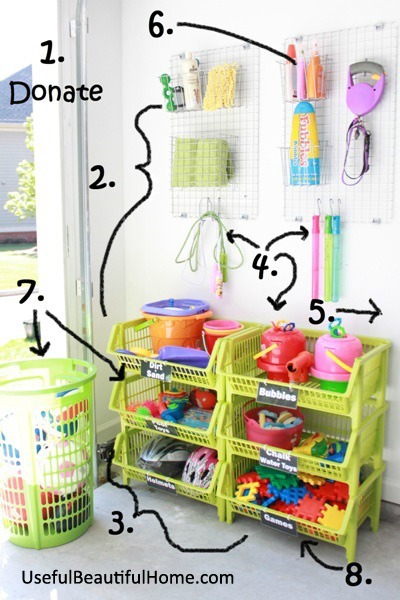 Her first post today is all about organizing garage toys and I love what she’s done and I think you will too. This is just awesome! Teaching concepts of organization to young children begins with implementing kid-friendly systems wherever necessary. 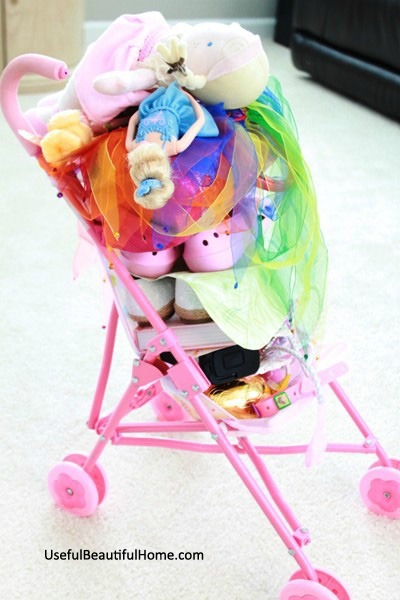 The ultimate goal is to intrinsically motivate your little one to use his learned abilities for organizing and controlling clutter (especially for later in life). 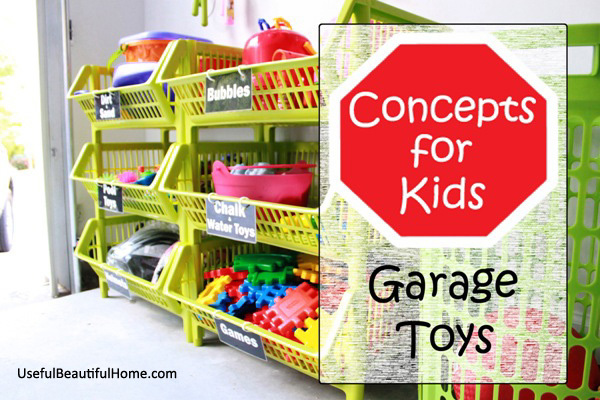 Today I’ll show you how I created an uncomplicated framework for our garage toys. 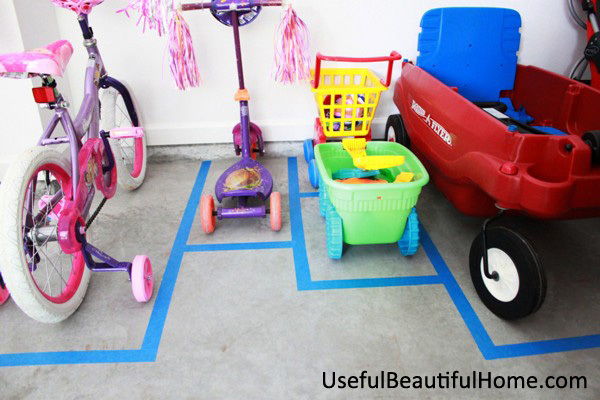 There are dozens of beautiful, color coordinated, organized garage systems to drool over on Pinterest. 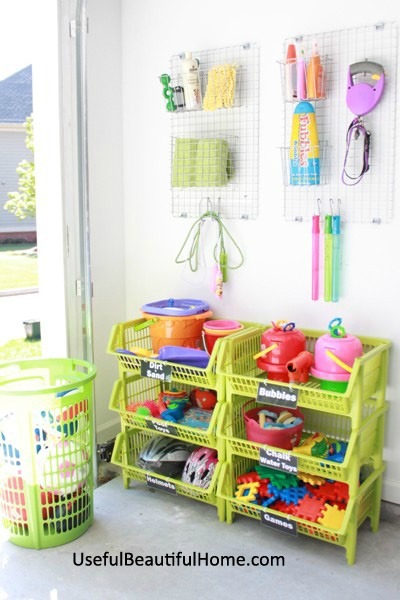 Many of them cleverly include outdoor toy storage. One thing I started noticing was most are not designed with young children in mind. They usually consist of a tall shelving system, loaded with matching bins, and labeled in an attractive manner. Nothing wrong with that, my heart skips beats over organized eye-candy, but it just won’t work for our household. Let me explain, organization doesn’t come easily for my 4-year-old. In fact, she tends to construct cluttered piles with serious talent. If I want to teach my little girl about properly caring for her outdoor toys, I’m not going to busy myself by putting her things back into bins and boxes up high on shelves. In fact, at her small height, I’m pretty sure she could only manage to reach the bottom one or two shelves. Furthermore, most bins are opaque and include lids and labels. My daughter isn’t old enough to read, can’t safely pull large bins off high shelves, and isn’t good at removing cumbersome lids. With that type of framework, I would always be a part of the toy retrieval AND clean-up processes. 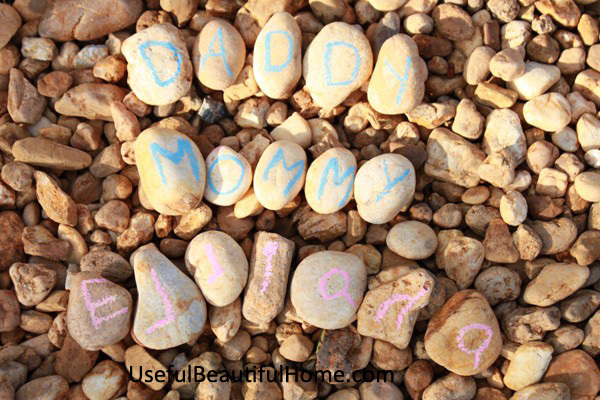 Frustration would eventually lead her to give up and go play with rocks instead. So, what makes a storage system easy for a small child? First priority was finding a bin system that would make clean-up EASY. I searched for a while until I found these baskets at The Container Store. You can also find a set of four white ones on Amazon HERE (affiliate link). They’re stack-able and customize-able for any space. They are narrow enough to line along the edges of the garage without interfering with open car doors. They DO NOT have lids or latches that require young children to open/close. They are ventilated for air to circulate and dirt to fall through for sweeping out the door. 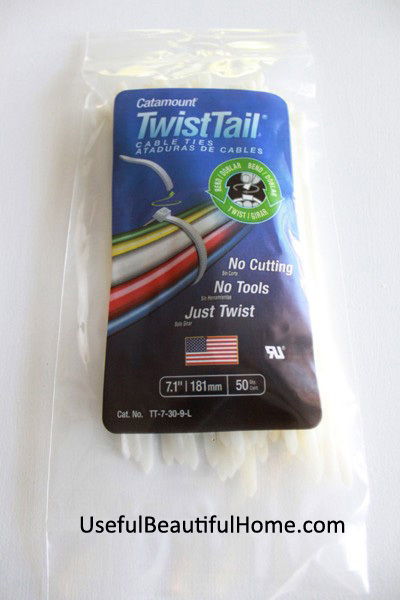 They are relatively inexpensive compared to most major organizing systems. Virtually no assembly is required. I hooked two columns of bins together with small plastic cable ties I found at Home Depot. Also available on Amazon HERE (affiliate link). I wanted to keep the whole system as stable as possible. I’m still debating about anchoring them to the wall, but for now it seems sturdy enough for our purposes. I created some basic labels to help keep similar items grouped together. 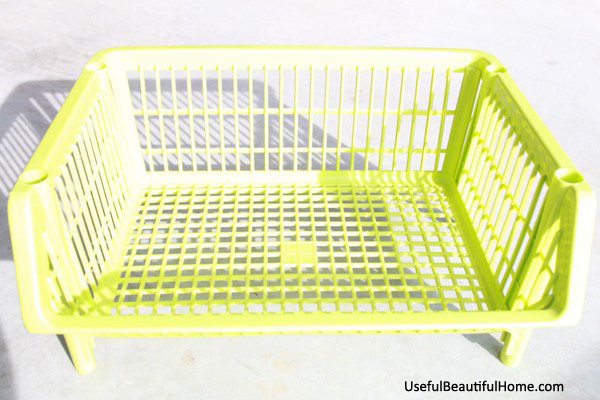 I laminated the tags for durability and then used the same cable ties to adhere them to the baskets. 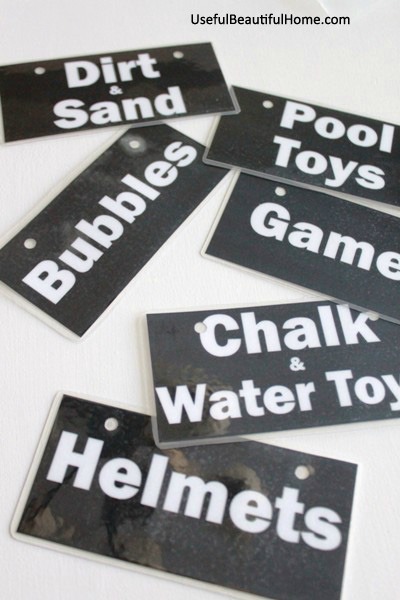 If you’d like a copy of the labels to use, feel free to download and print the 6 Garage Toy Labels printable. I have my daughter and her neighbor friends getting in and out of these bins. So, I’m not looking for a sophisticated or elaborate garage system to organize toys. I don’t want to spend hundreds of dollars setting up an expensive wall unit. The purpose here is to teach independence in using and then cleaning up outdoor fun. That said, not everything fit perfectly in the bins I found. Specifically, the bouncing balls were too big and too many. 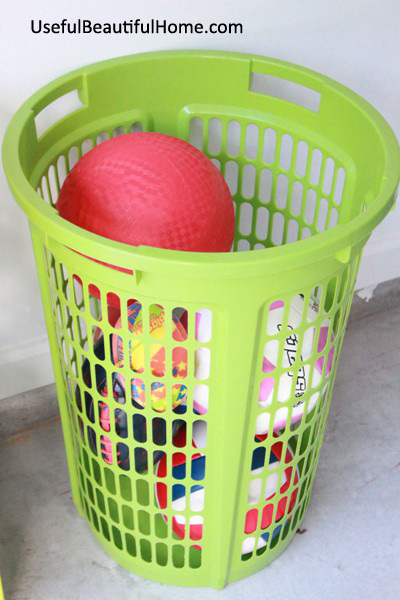 I stumbled on a narrow upright laundry basket at a Dollar Store. I knew it could contain all the outdoor balls, allow for easy access to them, and be as simple as shooting a hoop for clean-up time. Here’s something similar on Amazon (affiliate link). I also had to address the randomness I wanted to include in this kids’ zone. Not a problem with something called the Deko-System (also available from the Container Store). 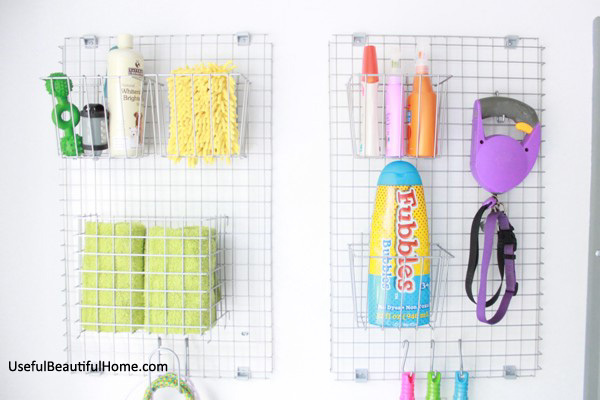 It’s a lightweight grid that holds customize-able bins and hooks (like a modern version of a peg board). I use it to hold our sun block, bug spray, and dog paraphernalia. I wanted the chemical agents of sun block and bug spray out of reach for both dogs and children. I know to some people, a dog is just like another kiddo, so I included the family pet here. In our case, it seemed fitting to keep her leash, waste bags, and throw toys within reach. With this grid system, I can rearrange until my heart’s content. 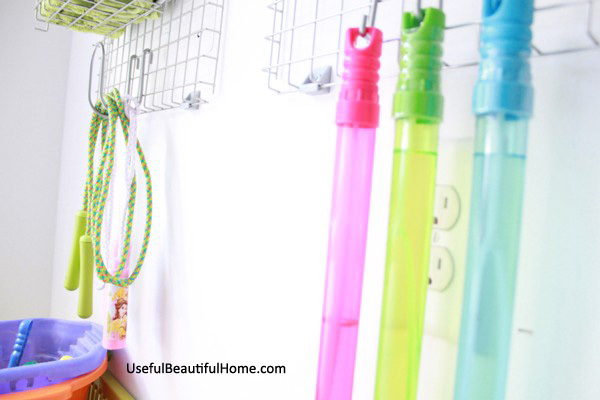 The Decko-System also offers a convenient way to hang some of the more dangly toys, like jump ropes. I’ve addressed the outdoor containerized toys, the ball cage, and the miscellaneous items. How about tackling storage solutions for bigger items? Then, I made corresponding picture labels in Word to assist small ones (who can’t read) in returning the items to designated places. This works great for us! My daughter loves matching up the toy with its parking spot. I think I’ve covered all the major areas of outdoor toys. Naturally, if your children are older, some of these methods won’t apply. If you have both old and young children at home, you can incorporate open bin storage down low for young children, and utilize upper wall space/tall shelves for older kids. Get rid of what your children don’t play with or what you don’t need. This is a basic rule of thumb that bears repeating. 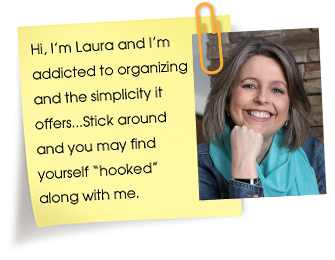 If you find yourself stuck in this step, follow Laura’s Organizing PROCESS. 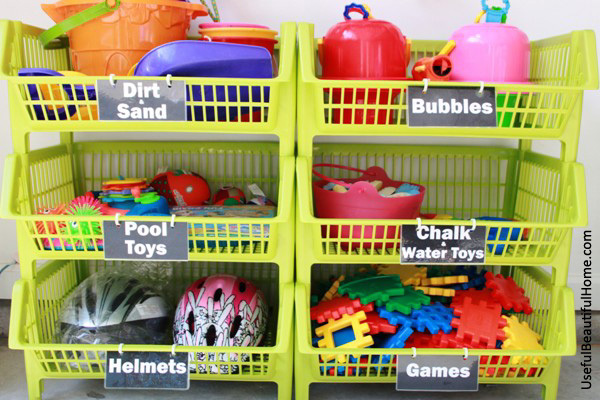 Create a system that involves containers to set boundaries and limits to the toy collection. Choose a versatile system that will adapt easily to multiple children and grow with their changing toy habits. Store similar items together in groupings. Keep your storage system at eye level or below for small children. If they can’t see it or reach it easily, they won’t play with it. Always be sure harmful and dangerous “toys” are out of reach. Try to avoid heavy containers or other hard to use storage bins. Your children will get easily defeated if they can’t manage to easily access their outdoor toys. I have found that assisting children in developing organizational skills can teach the value of stewardship, pride in ownership, and the virtue of responsibility! Genius! I especially love the comment abt open storage allowing dirt to fall through and then be swept up. With that in mind, I think I’d probably reverse the order of a couple of the bins, moving helmets to the top of the stack and dirt/mud items to the bottom. Thank you for some fabulous ideas! Thank you, Elizabeth, for the kind comments! Our largest sand/dirt bucket was too tall to fit upright in the bottom bin. However, you make a very logical (and good) suggestion for other Moms! 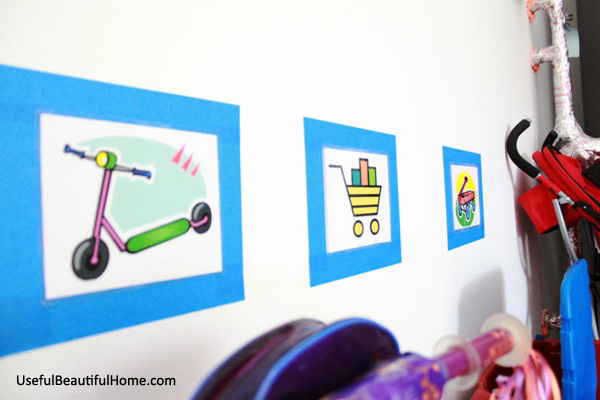 Love the stacking baskets and double love the parking space ideas and laminate pictures! Great find on the upright basket. I was just going over product ideas for ball storage today for a client! Thanks! Thanks! Great ideas. I especially like the parking spots! Glad you like it, Eydie! Thank you for submitting a comment! Love this. Even showed it to my husband! FYI, the shelves are $9 currently at the Container Store’s site. They are on my wish list! Lol, hope your hubby liked it as much as you, Annette. 🙂 Thanks for the price check! He did! We won’t be doing the baskets any time soon (budget), but they are fabulous for many reasons. We don’t have room in our garage for the lawnmower (and more), garbage cans, and two vehicles to make taped homes for the bikes, but I still think it is a great idea! How did you know I planned to clean my garage this weekend? Even though my kids are old, I love the concepts and I think I can adapt this for the rest of our household garage stuff! What a treat to read! I love the parking lot and bin ideas that I just might start incorporating ASAP. Thanks! There are some really good low cost ideas you have mentioned in this article! We have a product we represent called Monkey Bars, they have a bit more modern industrial look but they do a great job and can support a lot of weight. We have helped with many installations and have helped hundreds of families reclaim their garage space. This product give many options and help you choose the best possible solution for organizing your garage mess into convenient and accessible storage space. 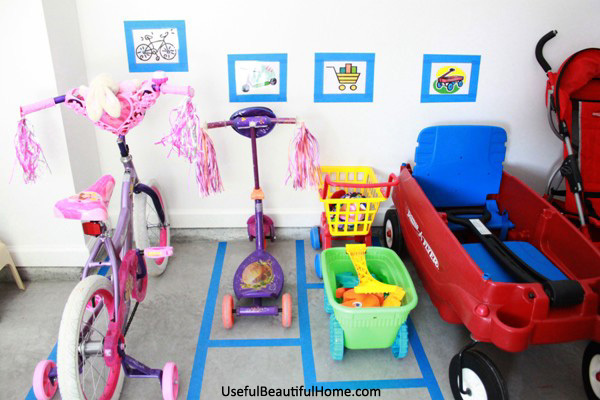 Great post – thank you for offering such great tips for parents to help organize their garage in a fun, accessible way! May I say, AWESOME? Thanks for sharing! Love this! 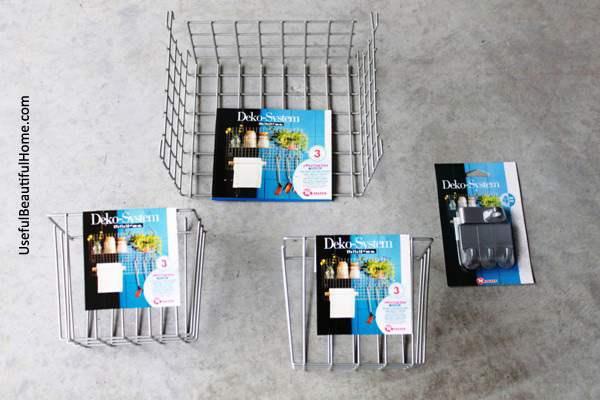 Online at the Container Store right now… What size stackable baskets did you go with? Regular or large? I have a three-year- old daughter and she already has so many toys that I don’t know where to put them. Amazing ideas in this article! Thanks a lot! Can you share the link or the the name of those baskets? I can’t find them on the container store site.